I asked her totally out of the blue. We were driving home from an afternoon of running errands. And it was just on my mind, so I asked. She’s seven, and she’s got a hefty dose of white-guilt coursing through her veins. It automatically puts her on edge around people with different shades of skin. And mostly, society has told her to just be quiet about it. Otherwise, things might get a little “aw-kward”, as my son would say. So I’m bucking the trend that society prefers. I’m asking her to talk about it. I’m opening up space for her to tell me her thoughts and feelings. And we’re fumbling around and figuring it out together. I’m talking with her. But I want more. I want you to talk with her. She needs to know that other white people have some of the same thoughts and feelings. She needs to know how you’ve worked through them in your life. She needs to know that black people aren’t mad at her, even if they’re mad at her ancestors or society in general. She needs to know what you do think about her and how you think she can help. She needs to sit down with a “tough-looking” black man and see that, even if he is big and strong and wearing a hoodie, it doesn’t mean he intends to harm her. She needs to know that brown people are facing their own equality struggle today. She needs to hear that, when you walk into an upper-end yoga studio with your two white friends, the hostess tells your friends where the class is meeting, then turns to you and asks if you’re hoping to use public restroom. But she also needs to hear that you don’t blame her for that and that you want to be her friend, even when other people with the same color of skin as her can be really stupid sometimes. She needs to know that yellow people get pigeon-holed and stereo-typed…that your property manager wouldn’t answer you questions about your bedbugs because he “couldn’t understand your accent”, even though you speak perfect English. But your bedbug situation was quickly addressed as soon as your white friend got involved. She needs to know that, even though this is irritating and hurtful, you don’t blame her for it. And that you’d really like to be her friend. Mostly, she needs to know that you and she are more alike than you are different. 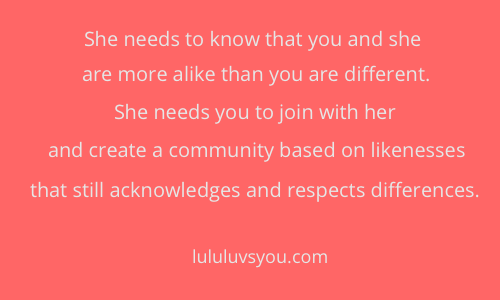 And she needs you to join with her to create a community that’s based on those likenesses but still appreciates and respects the differences. She needs you to help her learn how to fight for racial equality and to strive for racial reconciliation. And when I say she, I mean me. So I’m starting by inviting you to this space. Will you consider writing a guest post for this blog? Will you share some of your experience, some of your thoughts, some of your stories, some of your own questions and insecurities? Because I believe that’s the first step. Putting aside our differences to really hear one another. I’m working on putting together a list of resources to help us navigate these waters. But I really think speaking with one another is the best place to start. So…the invitation is open: Let’s Talk! If you’d consider contributing to this series, I’d be honored to share your words in this space. Just let me know in the comments, and I’ll get ahold of you to coordinate your submission. This post is the sixth in a series titled “But I’m Not Racist!” You can see the full list of posts here. Please join me as I carefully tread this sacred ground.